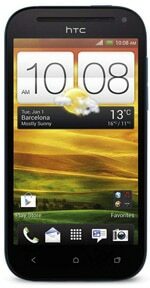 The HTC One SV is a mid-range Android 4 smartphone with LTE and NFC. The device boasts a 4.3-inch 480 by 800 pixel touchscreen. The One SV is driven by a 1.2GHz dual-core Qualcomm S4 processor and features a 5MP camera with LED flash and Beats Audio. The HTC One SV is available now and retails at around £340 SIM-free.